A writer who fixes too much attention on the correctness of his punctuation, or a reader who does the same, is missing the point: the job of text is to communicate, not satisfy pedantic rule makers. I have a slew of new-to-me terms that pertain to language all of a sudden, so I'll dole out a few of them today. This week's words concern pronunciation. Everyone has a set of words that they used to mispronounce because they learned the words by reading them. Epitome. Albeit. Quay. Victuals. Hyperbole. Ennui. Viscount. Hegemony. Behemoth. And many more, and I'm sure you have your own list. The folks at the Talk the Talk podcast have a name for words like this: only-read-it-ism. This I learned from one of their tweets, where they were responding to someone who was grumpy, and rightly so, that he had been mocked for pronouncing lingerie as it's spelled, and not in that peculiar way that we Americans do (lawn-zhuh-REY). In their tweet they added the word calliope, which when pronounced kalley-ope is yet another only-read-it-ism. By the way, if you like language, you will enjoy the Talk the Talk podcast, which is from Australia but has an international cast. An only-read-it-ism becomes evident only when someone actually attempts to say the word out loud. Those of us who've had the embarrassing experience of producing an only-read-it-ism might develop a sudden hesitancy to use in conversation a word we are comfortable reading (or writing) on the page. Right? The editor Elizabeth d'Anjou calls this pronunciation anxiety. Her example—and a good one it is—is desultory. Are you prepared to say this word out loud with confidence? Yeah, me neither. I don't know if Elizabeth invented the term, but as with only-read-it-ism, I'm just glad we have it. On to word origins. Not long ago we were at the Discovery Garden up north of us and I was reading labels for various trees. One of them was a crabapple tree, and someone asked me what crab- meant in crabapple. I opened my mouth to explain, but nothing came out. And it's not actually that clear. What it looks like is that there was a word scrab (scrabbe) for the fruit, which probably came from Norse and still exists in Scotland, and which might have lost its initial s-. On the other hand, the word crabbed has been used to describe disagreeable people since the 1400s, with a similar meaning in German. This sense might come from the animal crab, which walks crookedly and has a reputation for being, well, crabby. This might have evolved to then refer to churlish people, to crooked or gnarly wood, and to other unpleasant things. 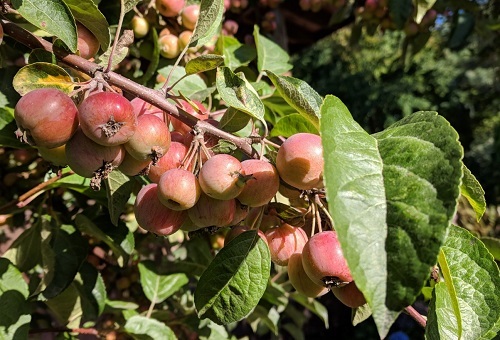 The crabapple is sour, and the OED includes this marvelous explanation: "A fruit externally promising, but so crabbed and ill-conditioned in quality, might very naturally be so called." A crabby apple.